The Ganesh Festival 2012 is going to start from 19 September 2012. 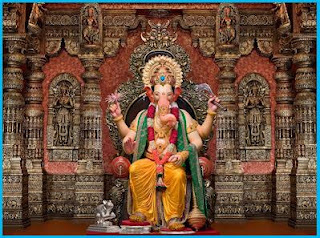 In all over Maharashtra Ganesh Festival celebrated with fun, joy, and happiness. Lalbaughcha Raja 2012 is the famous and biggest attraction of Ganpati festival Mumbai. Recently the images of popular Ganesh Mandal publishing in news papers. Watch here images of most awaited "Lalbaughcha Raja 2012" first online published in news paper. Ganpati Bappa Morya, pudhchya Varshi lavkar ya. may all be blessed bySukhkarta+Dukhharta,Sri Ganeshay Namah!!!!!! !